Simon from Flashlight TV has been a long time customer and friend. When he asked me to work on the design and development of his TV production company, I jumped at the chance. Shooting high end, broadcast stuff like Hunted and First Dates as well as corporate stuff for people like Cadbury and Barclaycard, I knew there would be chance to create something wonderful. 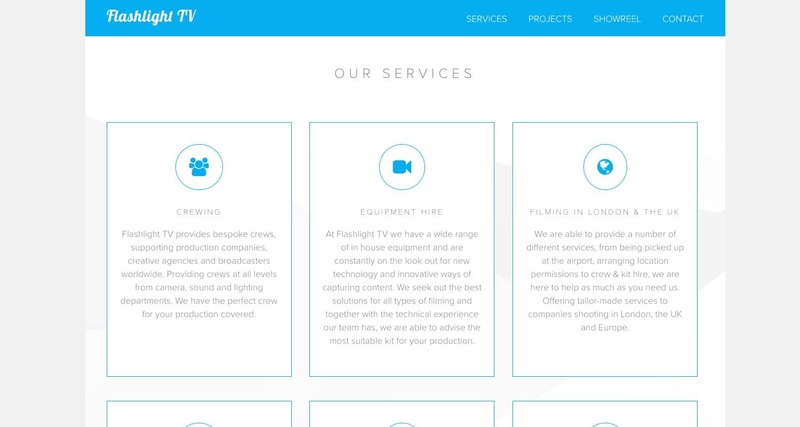 The result was a simple, minimal and very clean website that perfectly shows off the services of Flashlight, as well as the vast array of work they have undertaken. It is a great example of how great design and UX can focus a user down certain paths and increase your ROI. The beauty in this website is really in the conversion rates and KPIs we've hit! Rob created a wonderful end product for us. We've worked with him for years and wouldn't hesitate to recommend him to others. He's great at what he does, and he knows that the end result isn't always about looking shiny, it's more about how many customers you get through your site.